The message of this Advent season, and Christmas which follows, is easy to miss. We all know what it can all too easily become. What we need to hold onto is that, although it involves a retrospect memorial recreation of the birth of a baby, is was actually the inauguration of something permanent, transforming, and ever present, in way in which the literal Incarnation is not. That is, the coming of the Kingdom of God. Mary’s magnificent prayer, recited every evening by many people, is not just about the coming birth. It is about the coming of the reign of God. Right through Jesus teaching, and highlighted in this passage of scripture which we call the Magnificat, we see three major obstacles to the coming of the reign of God in the lives of people. We might label them as “three P’s” : power, prestige and possessions. All of them constitute less physically tangible but nevertheless very powerful “idols” – things which take the place of the God in our lives. We either love them too much, prioritise them too much, or actually trust them more than we trust God. That is an idol, and it stands in direct opposition to the Kingdom. 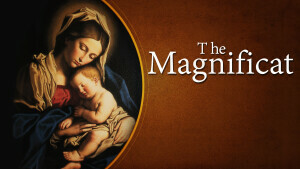 Mary refers to them as “the proud, the “mighty on their thrones”, and the rich. God is, according to Mary, routing, pulling down, and sending away empty those who follow these false gods. As I researched this short talk, I read at a certain time, the Argentine government actually banned the reading of the Magnificat at protest marches because they considered it so subversive. It might be argued, that of all the things that Jesus teaches against and warns us to avoid, most if not all of them could be placed under one of these three headings : power, prestige and possessions. And yet, so much of the church’s focus, when it comes to addressing the things that lie at the root of the evil in our world, is on other things – the moral sins of the flesh, or religious differences seem to rate much higher than addressing these corrosive idols. Similarly the world around us is even more superficial, obsessed with other bodily idols such as image, physique, personal beauty, eating and drinking, seem to concern the world more than outright social justice or any transformation of the world order. We should remind ourselves that Jesus came to the world in a human body – God was telling us that it was good to be human, so good he would take it upon himself. The Christmas story is amongst many other things, highly affirming of what we are – human beings. But it does try and point us to the right relationship with God, through the mechanism of being right with each other. Power, prestige and possessions do the opposite of that. Obviously things like sexual morality, and healthy self image are important. But surely, if you unwrap these “sins”, if that’s what they are, they have far more to do with weakness, addictive behaviour, or lack of emotional healing, rather than malice or evil intent towards others. Jesus once said, tellingly, that prostitutes are getting into the kingdom of God before those who had made easy bedfellows of the idols of power, prestige and possessions (Matt 21:31). These idols dull our hearts, numb our consciences, and lead us lead us to obsessions of the self. It is these sins of the mind and heart, and the orientation of our true love away from God towards things that are not God, that concern the bible more than anything else. God is to be our God not because he has rules that we need to keep, but because he longs to be the sole object of our loyalty, love and relationship. To really accept the baby into the manger and all he stands for, we need to look at our lives and see where there is an unhealthy clinging onto status, power, prestige and pride, and material possessions and the false safety they bring. Peace, goodwill, and good news to all mankind, was actually to be far more radical than anyone thought…..perhaps even Mary herself.